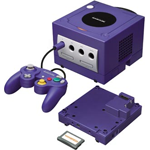 The Nintendo GameCube lived up to its name - a little, purple cube that played games. Outside of this, the system saw Nintendo experimenting with a number of control methods, some of which would later be refined for the Nintendo DS and Wii systems. Nintendo GameCube hardware uses the serial code DOL (Dolphin). Nintendo first system to use optical media discs, the GameCube is a small box shape with four controller ports on the front, a disc loading tray on top and an expansion port on the underside. The system's nameplate on the disc lid could be removed and replaced with either officially released plates, or any image cut to the right dimensions. The GameCube controller features two handles and four "circles" on the face with different buttons. There are two analogue sticks, a + Directional Pad, 5 face buttons and three shoulder buttons. The L & R shoulder buttons also feature graded sensitivity, so a light press might react differently to if the button is pressed the whole way. The Wavebird Wireless Controller is shaped the same as the GameCube Controller, but with a box for receiving AA Batteries as well as sending/receiving a wireless signal to the receiver connected to the controller port. Up to four can be used at the same time by switching between wireless channels. A cable used to connect the Game Boy Advance to a GameCube controller port. This allowed for games to be downloaded to the Game Boy Advance's temporary memory, or for the Game Boy Advance to be used as a controller or input device for GameCube games. A set of plastic bongos with a soft skin on the top and a microphone in the middle. The DK Bongos distinguish between four types of input: Left, Right, Both and Clap. The DK Bongos could only be used with compatible games. The GameCube Microphone allows for voice commands to be used with compatible games. A Microphone Holder can be used to attach the Microphone to a GameCube controller for games where both are required. The GameCube Action Pad is a large dance mat with four directional inputs and B & A inputs, to be controlled by the feet. 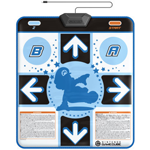 The Action Pad can only be used with compatible dancing games. A modem or broadband network adapter that can be connected to the GameCube's Serial Port 1 on the underside of the system, allowing for online play with compatible games. The Broadband Adapter could also be used for LAN play with compatible games. 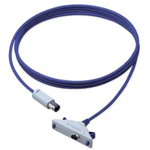 An accessory that connects to the Parallel Port on the base of the GameCube, and allows the player to play Game Boy, Game Boy Color and Game Boy Advance games on the TV. The Game Boy Player does not take advantage of Super Game Boy enhancements.